Designed to be an indestructible diving watch, it was subsequently chosen to equip France's Air Force pilots in the 1970s. With its deliberate vintage look, this historic tool-watch is available with a large selection of bands. Initially designed to be a robust and reliable diving watch, it was then chosen to equip France's Air Force pilots in the 1970s. This new Yema Superman named "Swell", with its unique black dial and white round markers, inspires from the tidal wave movements that cause the sea to swell. This redesign of the famous 1964 Yema Superman 24.11.17 takes over many classic features from its ancestor . Initially designed to be a robust and reliable diving watch, it was then chosen to equip France's Air Force pilots in the 1970s. With its absolutely vintage look, it is available today in automatic and quartz versions with a large choice of bands. The iconic chromed seconds hand with its head shaped like a shovel is exactly the same used in the 1970's original model. This Swiss quartz movement is composed by 3 hands and date. Thanks to its Its stepping motor and power saving mechanism consumption is reduced by 70%. 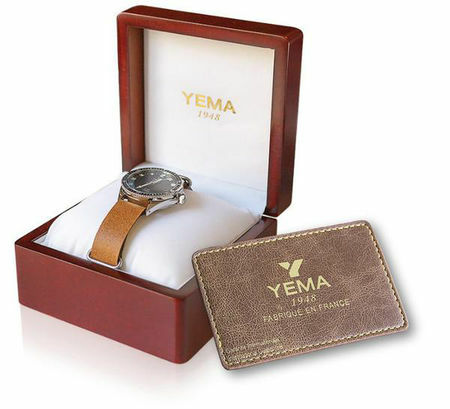 The caseback displays Yema's historic coat of arms, engraved with a hydraulic press. The famous "Y" stylized and the symbol of Yema's vintage logo can be found on the coat of arms. Unidirectional with black insert graduated in 60 divisions and 316L steel. Bezel with lock mechanism at 3:00.